Places to Fish: Kelowna, B.C. Kelowna is the largest city in the interior of B.C. and a major year-round tourist destination. With dozens of wineries, houseboat rentals, great beaches and phenomenal skiing, there's no shortage of ways to keep your family busy while you slip off for some fishing.Tackle ShopsTrout Water Supplies is the top tackle shop in the Kelowna area, and your best bet for finding the fishing gear you're looking for. Plus the staff is great and super helpful. While they specialize in fly-fishing equipment, they also have a great selection of casting and trolling gear.Heading south? The Hy-Mart convenience store at the intersection of Highway 97 and the Old Okanagan Highway in West Kelowna has a surprising amount of fishing gear. Just minutes away from the popular Shannon Lake, Hy-Mart has what you need for every kind of fishing from ice-fishing to carp.AccommodationsWithin the city limits of Kelowna you will find every sort of accomodation from luxury suites to hostels. While all the big-named hotels are present, you can pretty much pick your fave. However, if you're looking for something a little more rustic, here are a few options:Bear Creek Provincial Park is a great camping spot on Okanagan Lake about 15 minutes from downtown Kelowna. For more info check out the website at: Bear Creek Provincial ParkIf Wood Lake is your destination, there are some great cabins at the Teddy Bear Lodge located on the lakeshore. They can be reached at 250-548-3757.For something a little more rural, check out Idabel Lake Resort. While it's less than a half-hour out of Kelowna, the tree-lined lake feels like true wilderness.And if you're looking for a great spot to tent near downtown, check out the Willow Creek Campground on Lakeshore Rd.Best EatingKelowna has a vibrant culinary scene, with some great restraunts in the downtown core. Here are some of the best:Fancy & Local-themed: RaudzEthnic: PoppadomsHole-in-the-Wall: Mad MangoOutdoorsy: Montana SteakhouseLocal FishingWood Lake is a popular spot, located just 10 minutes north of Kelowna on Highway 97. Fishermen target both Rainbow Trout and Kokanee which can both grow in excess of five pounds, but will average in the 1 to 2 pound range. Trolling with gang trolls is the most popular technique, while Lyman Plugs, Hot Spots, and Flatfish will all produce. This is also a popular spot for ice fishing in the winter months.Okanagan Lake has good fishing for both Rainbow Trout and Kokanee, as with Wood Lake, trolling is the most popular technique. Both fish grow large in the biggest area lake, with Rainbow Trout commonly topping 10 pounds with Kokanee not far behind. Until this past summer, Okanagan Lake had the distinction of holding the world record Kokanee (a 9 pound 6 ounce beast), however, the fishery has tapered off in recent years and seems to be closed just as often as it's open. Check with B.C. Fish and Wildlife (250-387-9771) or the local tackle shops for the status of the fishery. Bucktail flies are popular for the big rainbows, while Hot Spots and Apexes produce the biggest Kokanee. Anglers looking to try something different can target large carp (5 to 25 pounds) from the shores of downtown Kelowna.Looking for some smaller, more manageable water? Look no further than Shannon Lake. With an aggressive stocking program in place, there are always eager trout to be caught in this urban fishery. The stocked trout flourish in this fertile lake, with fish up to 5 pounds caught each season. Shannon Lake also has an abundant population of Largemouth Bass. While the bass once had an average size of 1 to 3 pounds, poor management and a "Catch-and-Keep" mentality has affected this once promising fishery. While it is still common to catch 50+ fish in a day, roughly one-tenth of these will top a pound. That said, there are still big fish present, with bass up to 6 pounds possible for dedicated (or lucky) anglers. This 2.5 pound bass is an absolute lunker for Shannon Lake. While they might lack in size, they more than make up for in abundance making it a great place to take beginning fisherpersons. A short drive east of Kelowna up Highway 33 leads to a cluster of small lakes which receive little pressure. Idabel, McCulloch, and Haynes Lakes are all great spots to take a canoe or small aluminum boat. With healthy populations of Rainbow and Brook Trout in each, these are good bets for fly-fishing. While the average size is relatively small for each lake, especially Idabel, with 12 inches considered a good-sized fish, the numbers of fish will keep the action steady.If stream-fishing is more your style, head further down Highway 33 past the town of Beaverdell to the West Kettle River. The West Kettle is full of scrappy trout in the 10-12 inch range, with the potential for bigger fish. During the warmer months, these fish will aggressively strike dry flies. Drive a little further down the road to Westbridge and you come to the confluence of the Kettle and West Kettle Rivers. The Kettle has larger trout, with a 12-14 inch average, although not quite as abundant as those in the West Kettle, it is a great fly-fishing spot, with many access points from the road. 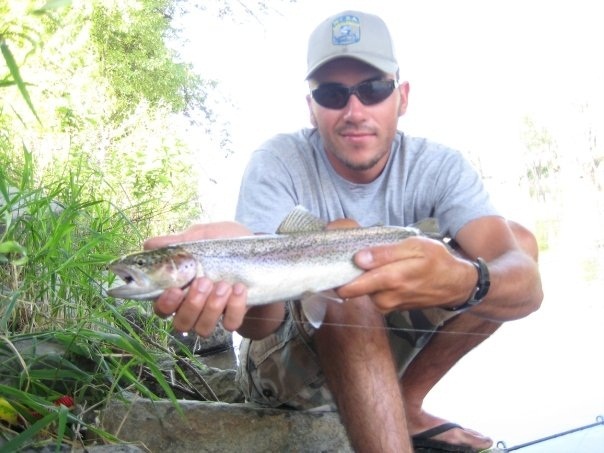 Rainbow Trout in the Kettle River are beautifully coloured and more than willing to rise to the occasion.West of Kelowna on the Highway 97C (Okanagan Connector) lie some excellent fly-fishing lakes for Rainbow Trout. Among those worth further research are Pennask, Kentucky and Alleyne Lakes, with the last two located next to each other. Kentucky-Alleyne is a popular camping spot and great place for families, as there are stocked fishing ponds in the provincial park that are only open to those under the age of 16.GuidingRodney's Reel Outdoors is a guiding service based out of Kelowna. Guide Rod Hennig offers trips for a variety of fish from Lake Trout to Kokanee.Passionate Pursuits pro guide service offers top-notch guiding in the South Okanagan. Head guide Dave Laycoe specializes in trips for Largemouth and Smallmouth Bass on Skaha and Osoyoos Lakes, as well as fly fishing excursions for Rainbow Trout.If Rod and Dave don't have what you're looking for in a trip, you can always talk to Savas and Nick at Trout Water Supplies who also book guiding trips and specialize in fly-fishing for trout.